About my second day in a city where it will always be hard to understand the country's culture, traditions and history. Today I woke up around 9.30 am. Simon was already working at the office, at least I heard his voice and the children were already awake for a long time. I could hear them play with their toys in the living room. I went for a shower, which actually was in a bath and during the shower Samuel told me he had coffee for me. I said I�d be out in a minute, but when I got out of the bathroom after 5 minutes, he was sitting on the steps with in his hands a cup of coffee. He looked very sad. �...I have been waiting five minutes...� Ironic. But he was right. 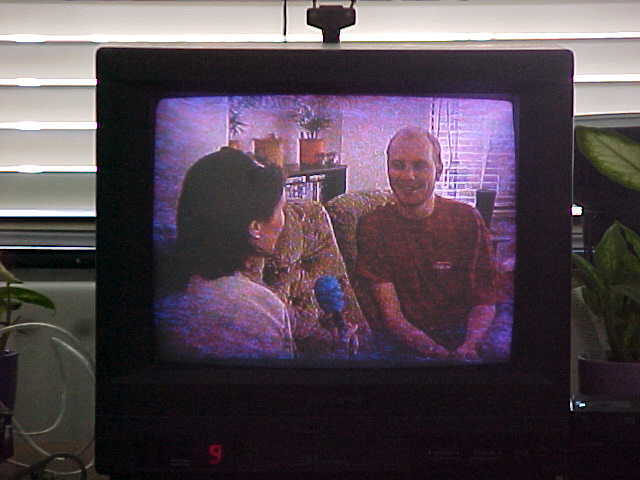 Today the whole house was a bit exited because the televsion would come over! 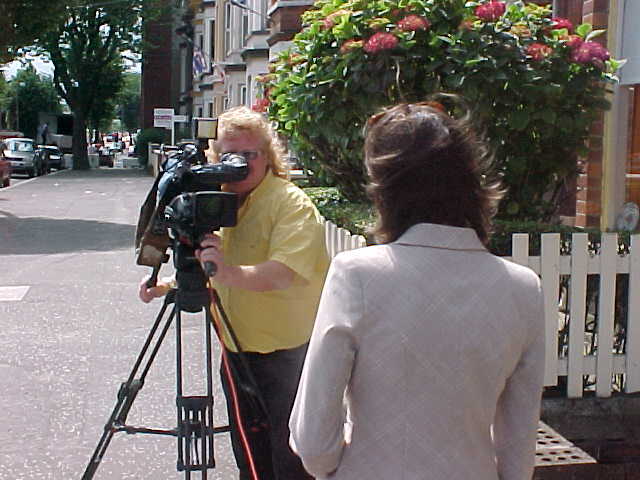 The Ulster Television (UTV) discovered me in Belfast and wanted to make a report about me and my travelling. 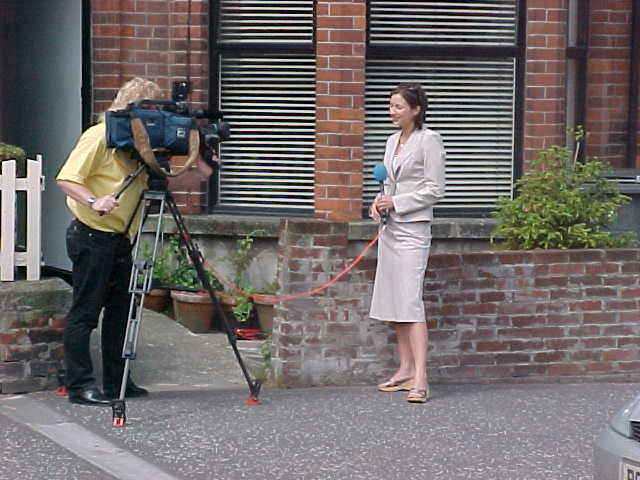 When the reporter Carol and her cameraman Albert arrived, Simon had already left. He has a thing against cameras. The kids where shy and played computer games at the office. No. Youngsters in the city, sometimes even low-educated, get bored and take a few drinks during the Holidays. And we all now that too much alcohol can light a fire, so if one person throws a rock, more will throw a rock. 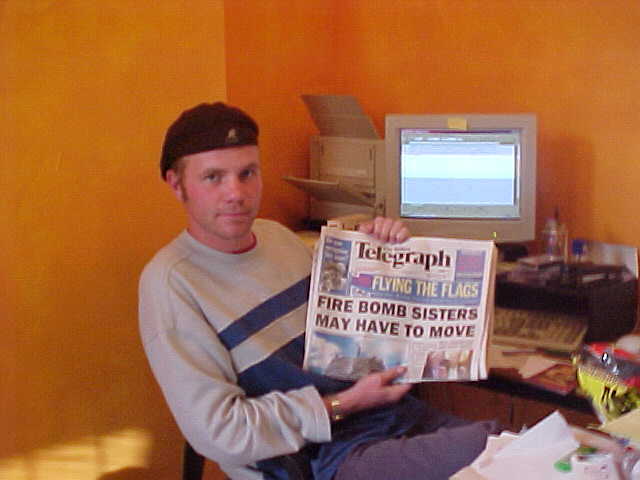 So when some teenagers in some street in some area in some Northern Irish city throw rocks to each other or throw in windows and it is captured my a press photographer, the newspapers write about riots in Northern Ireland! While the people in these cities here are very used to the violence. You just don�t go out on the streets after sunset. 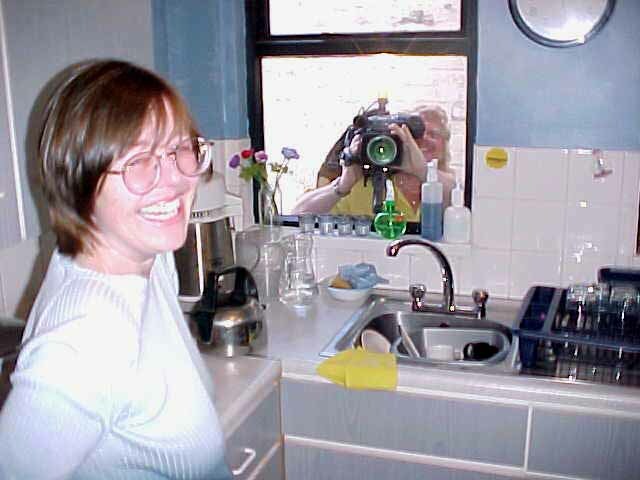 After Carol interviewed me, they changed the settings and asked questions to Sally, about why she ever invited me � a stranger � in her house. She told UTV that she had just heard about me on the 2FM radio in Ireland and for the good cause she invited me over. But when I called her last Monday to announce my arrival, she still was the only person who knew about me. Simon had never heard about me and the kids were told a world traveller would come over and visit them. The reporting ended as the reporter went outside for some shots of the house I was staying in. After a final cup of coffee they headed of to the editing rooms. The rest of the day I spent the times trying to report on these pages here, but I am being overwhelmed with emails. I currently get over 200 emails a day and it even gets hard to even start processing them. I scan subject lines and go for known people who mailed me before. I does not really interferes with my reporting, but it just takes some more time. While I worked on Simon�s computer while Simon was away for business, the kids were playing behind me at their game computer. It�s interesting how Sally lets them play for only half an hour per day � I think more people should have that rule for their children. By the way: Sally and Simon run their own independent business as resellers for Aloe Vera products, all over the world. From Aloe Vera Jelly 'till Aloe Vera Shampoo, the Shiels' family will sell it. In the afternoon Sally took me out for a walk and showed me around the neighbourhood, walking along one of the walls that segregate two different-thinking areas. Both areas have painted walls, the famous Belfast murals, supporting their separated forces. Right along the wall, on the peace line in Belfast, Samuel and Oliver�s school is located. It�s very hard to realize the situation if Samuel tells me that sometimes, when all the pupils are playing on the (with walls surrounded) playground, certain people throw big rocks over the wall. Nobody ever got hurt, but imagine your kid playing their and get a brick on his head? But for Samuel and Oliver it�s just all part of their lives. After dinner with all of us together in the kitchen, Simon told me he would take me to the bonfires tonight. 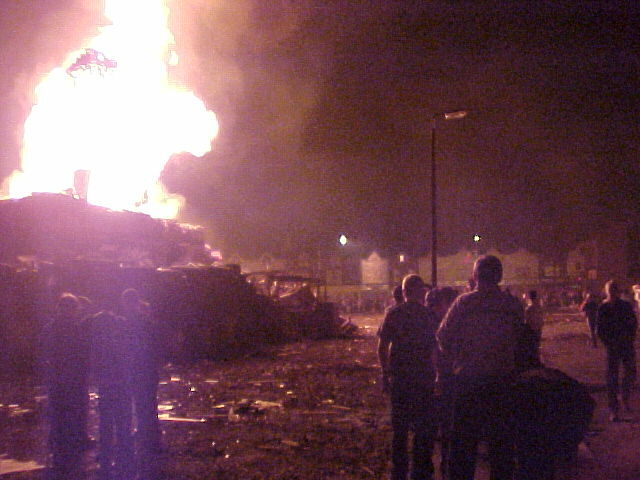 The evening before the celebration of the Battle of the Boyne (see previous report) huge bonfires are burned in Protestant areas. 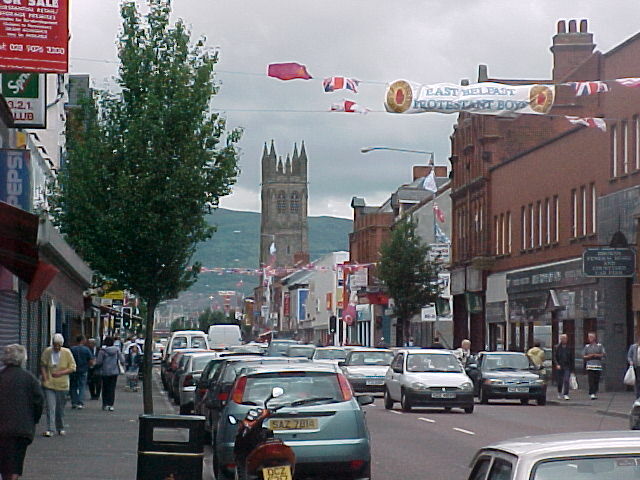 This kind of a festival is unique to Northern Ireland, and has often been a flashpoint between the Protestant and Catholic communities. 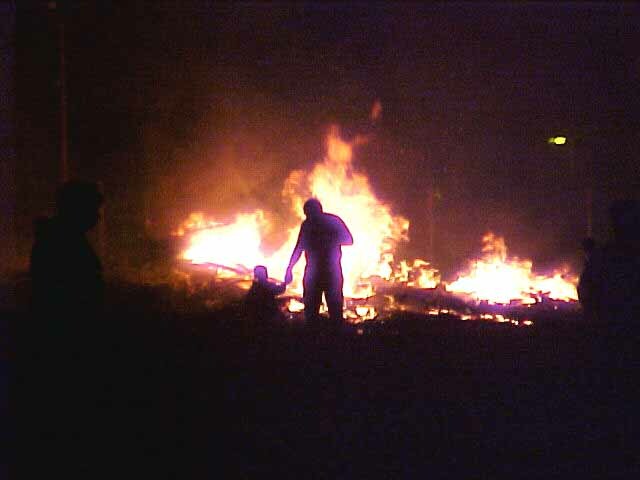 The bonfires exist out of pallets, rubber tyres, old furniture and actually anything that can burn. While the parents took a little after dinner evening nap, I kept on processing emails and uploading pictures. It�s a pity to be a few days behind in my reports. 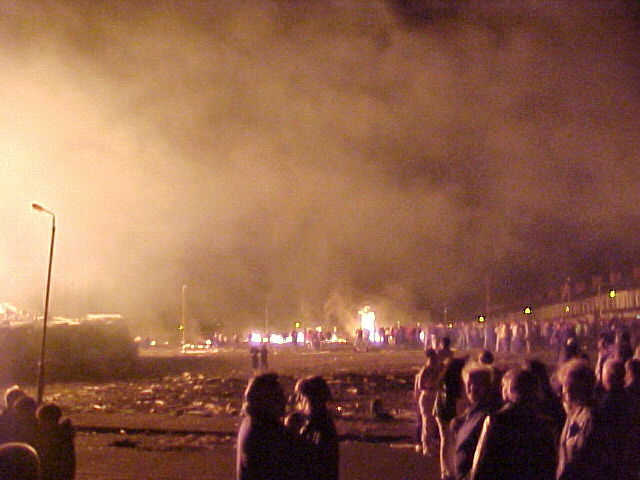 Around 11.30 pm Simon and I walked down the street and walked to one of the biggest bonfires in Belfast. This one was build on an empty area, where less than a year a go three streets of houses were torn down. And everything was paved flat. In the middle rose a big 80 feet tower of pallets, which would be lit on fire at midnight. Just after midnight the local youth who built the big tower, used petrol to light up the wood and within 15 minutes the complete tower part of the bonfire had caught fire. And while this happened, a deejay was blowing his speakers with trance music and little mobile booths sold booze and snacks. And when everybody started to cheer when the red-white-green flag (nationalism flag) on top of the tower got trapped in fire, it all reminded me of images I�ve once seen of native tribes who dance around fires. 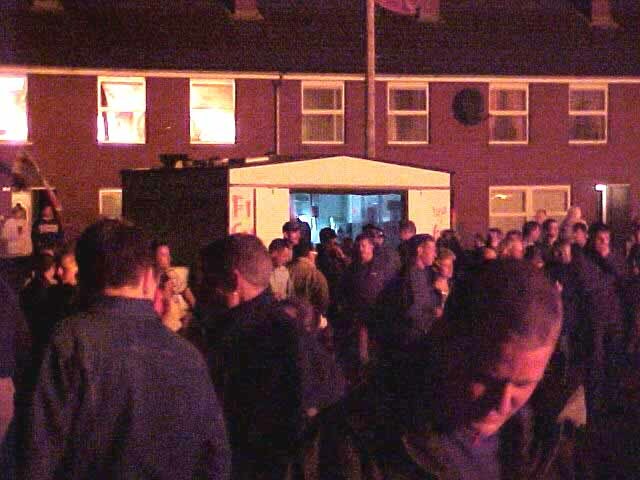 There are just two tribes in Northern Ireland and no politician can change anything in that. Nobody can obstruct these traditions, which goes so deep. 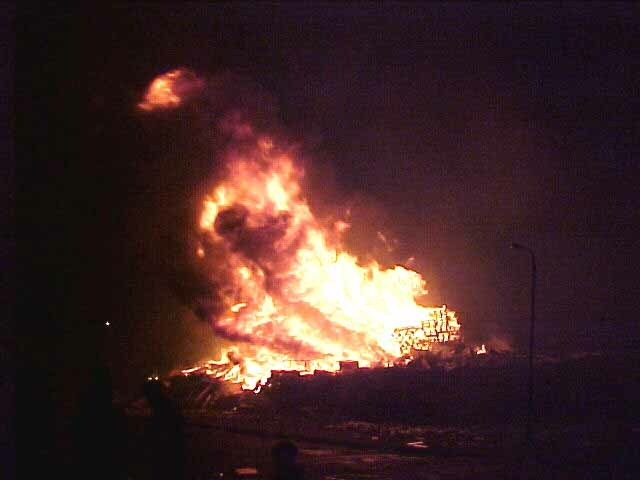 After the tower had collapsed, we really had to move back from the fire. Even at a 100 metres distance, it still felt as my clothes would catch fire soon. The heat coming off the bonfire was gigantic! And when the rubber tyres caught fire the smoke of it stayed low and darkened the view where the wind was blowing. I did not really felt like starting a discussion about pollution there, with all those people dancing and cheering and really enjoying themselves. Why bother? 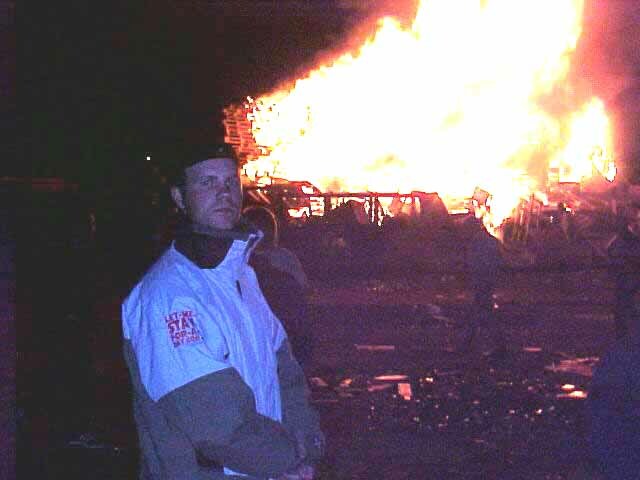 The reason I am not smiling on the bonfire photographs is that I just cannot enjoy with the local people. In this cause I really look at it all from a distance, not being in favour of one of the parties here. I want to stay unprejudiced and just be able to understand it all. When Simon and I left the site and walked home, we could see the smoke fumes all over the city. Probably some 14 other bonfires, from little ones to big ones, where lightening the sky. In one street a fire engine was entering a house that had caught fire, but nobody seemed to care. The few people walking down the streets were already tipsy or singing out loud. But, still, whatever I learned about this all, it all is a bit too otherworldly to me, here.